Instead of showing old cars, which would look jarringly different from today's styles, Toyota's Avalon commercials cleverly play with the old-fashioned glamour of streamlined trains and Jet Set-era airplanes, all done with a wink to update the attitude for the 21st century. The Avalon still looks bland, but the commercials do make the car seem roomy and, most important, its occupants seem fun. Chrysler, by contrast, offers a study in how not to use retro glamour. Here's the text, run sideways along four pages of muddy photos whose Manhattan skyline and pretty people are supposed to spell glamour. It wasn't long ago, America had it. We didn't race from place to place. Going for a drive was a big deal. At Chrysler we believe it's time to get it back. To regain the style, the cachet, the confidence. We say it's time to reignite the American dream. And the same design principles that got us there once will catapult us there again. Our aim is to design things that start out revolutionary and end up timeless. It's time to put our right hand at two o'clock and our left elbow out the window. To rediscover what it feels like to drive down the street and have every kid in the neighborhood running to take a closer look. Let's turn driveways into runways. Let's design cars people want to make out in again. Cars people want their photo taken with. And it should be available to everyone not just the privileged few. It's time, once again, for America to arrive in style. Car blogger Chuck Goolsbee posts some great photos under the heading “Car Photo of the Day.” The one above, featuring two of the world's most glamorous artifacts, is a particular favorite of mine. I’ll return to it in a moment. In a post last month, Chuck contrasted two photos of the same car. The first is the kind of snapshot-as-note-taking that I shoot all the time. Since it’s mostly to jog the memory, the composition doesn’t matter much. Hence, the headless car buffs, with particular emphasis on the guy in the orange polo shirt and shorts. Since cropping was the only manipulation required to produce the second photo from the first, few documentary purists would object. Recreating the photo held in memory didn’t require retouching the mechanical reproduction of the scene, only focusing closely on one piece of it. But go back to the photo of the E-type Jaguar and the windmills (click the photo or here for a larger view). Simply by recording a still image, the scene has been glamorized, portraying the car and windmills as autonomous icons of technological grace—no maintenance or transmission lines required. At the same time, however, the photo calls attention to distractions that would have gone unnoticed in person: the rough asphalt in the foreground and the fence interfering with the car’s lines in the middle distance. A glamorized version of the photo would remove or downplay these distractions, focusing the scene on its emotionally meaningful components. Profiled in The New Yorker, Pascal Dangin, today’s leading retoucher of fashion photos, called blemishes and flaws “anomalies,” suggesting that they distract from the truth. A retouched scene would be literally false. But would it be more emotionally truthful? One possibility would be to clean up the photo by cropping it, producing something like this. There are fewer distractions now, but the photo seems cramped, with less sense of movement and the open road. Cropping may be journalistically legitimate, but it's emotionally unsatisfying. Having read this interesting post in which photographer Mark Harmel discussed the sort of minor retouching he does to clean up distractions, I asked him what he would do with the Jaguar and windmills photo. He sent back this subtly altered version of the photo. The side of the road is less distracting, though the grass is now a bit too regular. And by correcting the car's front end, he made the photo more realistic—but less glamorous. “Bring out the best, conceal the worst, and leave something to the imagination,” was George Hurrell's formula for creating glamorous portraits. That prescription runs contrary to journalistic full disclosure. It also acknowledges the selection involved in all creative presentations. Neither an article nor a photograph reproduces the world in all its continuity and complexity. Ultimately, the correct selection depends on the creator's purposes and the audience's expectations. So which version of the car and windmills photo do you like best? Or can you do better? I can only imagine the hate mail this post will generate. Even if you dislike cars, my sense is that you'll have a list of cars you believe are more glamorous than others. And it is very likely that none of your cars are on my list of glamorous cars. For a person like me, who suffers from an abiding love of automobiles, as well as a deep fascination for all the people who've designed, built, and raced them, putting this list together was pure torture. In the span of fifteen minutes I created a list of 47 contenders, and only via much gnashing of teeth and multiple strokes of the delete key was I able to whittle it down to the final ten. Lancia Aurelia B20GT (1950): the archetypal two-door gran turismo, this Lancia is a most elegant expression of Italian design in the postwar period. This is the auto for two people deeply in love to tour the lakes of Lombardy. I fell in love with it after seeing it at speed in the pages of Tintin. Of all the cars on this list, this is my favorite. 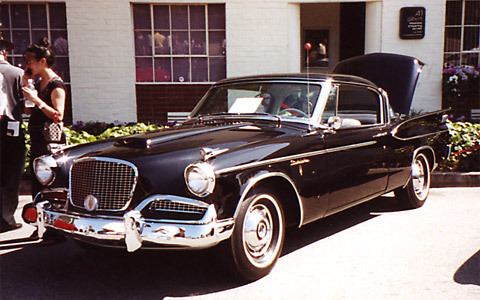 Sunbeam Alpine Sport (1955): Grace Kelly took Cary Grant for a ride in one in To Catch a Thief . Not a macho car, nor one of classic proportions, but a memorable shape nonetheless. Aston Martin DB5 (1963): Goldfinger. Silver. Ejector seat. Tire-slashing wheel spinners. Not so much about James Bond, more about Sean Connery. British glamour at its best, and arguably the high point of Aston Martin design. Ferrari 400 Superamerica (1963): For those of you who equate the Ferrari brand with gold-chain reruns of Magnum PI, please consider this: in the early sixties, Ferrari made just 47 of these bespoke beauties, each fettled with a hairy V-12 motor up front and exceptionally pure bodywork from Pininfarina. These were fast, glamorous cars built for kings. This was the Ferrari of Rockefellers, the Aga Khan, and Gianni Agnelli. Lamborghini Miura (1966): One of these came to a tragic end at the start of The Italian Job . I've stayed away from out-and-out sports cars on this list because the experience of driving them is often less than glamorous, but because the Miura captures all that was outrageous about pre-Vietnam '60s culture, it made the cut. If you could afford to buy and run one of these, you had money. And if you were attractive enough not to be shown up by its timeless styling, you certainly qualified as glamorous. Cadillac Eldorado Brougham (1957): Harley Earl's unique view of the universe is best personifed by this car, with its tailfins, dagmars, brushed stainless steel roof, and intricate metal detailing throughout. It featured suicide rear doors, stainless steel drink tumblers, a cigarette case, and even a perfume dispenser. Open those doors, and you half expect Marilyn Monroe to tumble out in all her platinum glory. Porsche 911S (1970): I had to put a Porsche on the list. So I chose the one that Steve McQueen drove around the countryside of Le Mans at the start of his movie of the same name . Before the 911 became a testosterone wagon, it was a compact, even lithe vehicle powered by a relatively small motor. An elegant Porsche. As such, I think it's the most glamorous car ever driven by McQueen, who was one glamorous dude. Range Rover (1970): the first generation Range Rover was styled by engineers, but like the American Jeep which came thirty years earlier, its design process spawned something of great purity from an aesthetic point of view. As its basic, utilitarian design added layers of luxury and power over the years, it was transformed in to the ur-SUV, a temple of jet-setting glamour and power. If in 1957 the Eldorado would have been your vehicle of choice, in 1987 you wanted to be seen in a Range Rover. The most glamorous ride ever to sport external door hinges. Toyota Prius (2004): not the dowdy first-generation model, nor the overly angular third gen edition. The second-generation Prius defined "hybrid" as a glamorous technological paradigm. Not only is this the only Japanese car on my list, but the Prius is the only one that Leonardo drove. Like all the other cars on this list, its glamour has its roots in power, but in this case it is about its relative lack thereof. What a difference 50 years makes... given a choice between this and the Sunbeam, I bet Grace Kelly would have driven one, too. When I saw this commercial for the Kia Soul with the adorbs hip hop hamsters, I realized the Soul looks an awful lot like a mix between my new car, the Scion XD, and the Scion XB, which is an awful like the new Nissan Cube, an odd-looking, economical box on wheels that is reminiscent of those higher-end boxes, the tank-like Hummer and early Land Rovers, both initially meant for hunting lions or terrorists, or terrorist lions, depending on your point of view. But I guess if you’re spending $80,000 and up on a car, luxury isn’t about capturing kitsch, irony, or youth culture. (Note: youth culture, not youth. $80K will probably get you a young girlfriend, though.) The appeal of the oval is more about capturing the speed of the compact design of Porsche. Or maybe it’s nostalgia for those molded steel curves of the Studebaker. I wouldn’t know. 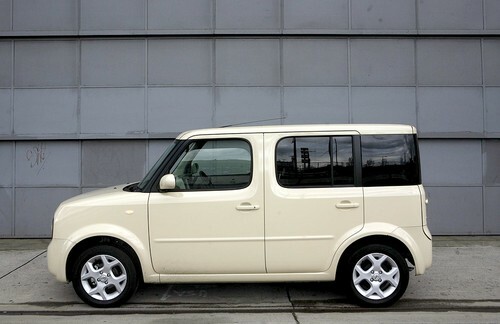 I bought a car that could be mistaken for the hip hop hamster car. And that is just fine with me.